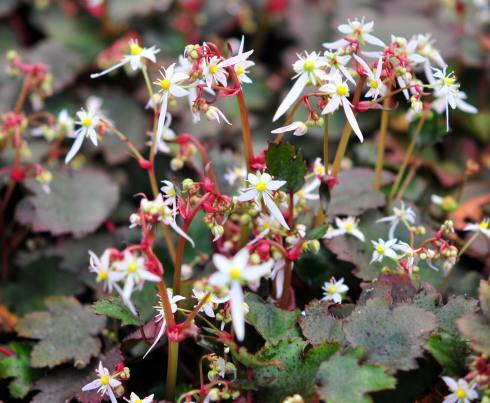 A complete break from the plants which most of us think of as saxifragas. The foliage of these plants is much more like a standard herbaceous perennial - generally palmate with deep indentations, quite fleshy with fleshy petioles also. 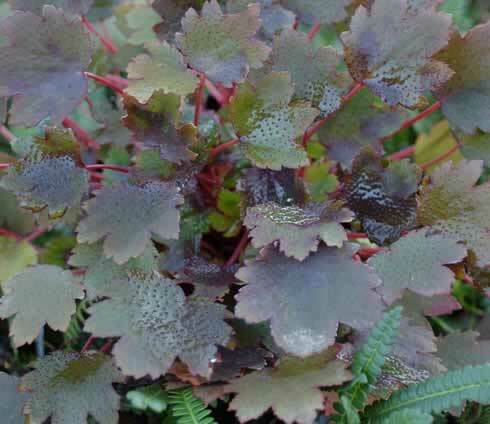 The foliage on this variety is bronzy-green on the upper surface and reddish-purple on the lower. The upper and lower surface are covered with fleshy bristles which are red in colour. The flowers are held in dense clusters on short stems above the foliage, colour is creamy white. The two lower petals are elongated adding interest.